School me on Supermoto please. Discussion in 'Road Warriors' started by Vulfy, Jun 26, 2012. So I'm trying to figure out, what makes a supermoto, "supermoto"? Is it just any old dirt bike that has road tires (not knobbies) and is street legal? Than what is the difference between supermoto and dual-sport? I'm looking to purchase an older bike, somewhere in 250 - 400 cc range, that is light, and can be dropped on the pavement without too much worrying about internal as well as external damage. Needs to be pretty low, no high stools that I'm seeing on some of the dirt bikes. It needs to have road tires, no knobbies of any sort. I need as much grip as I can get, and it will never leave pavement. This bike will be used for technical riding, so tight turns, sharp bank angles. Is it possible to convert a bike to be a supermoto? Is it better / cheaper to buy a supermoto bike that is already supermoto, or just get a dirt bike and convert / street legalize it to be supermoto? Would I have to change suspension on a dirt bike, to make it softer / harder for street / technical use? How durable are these bikes? If I'm putting her down on pavement from time to time, do I need any additional protection such as sliders, or are they designed to be well protected by default? First and foremost, Supermoto is a form of racing. 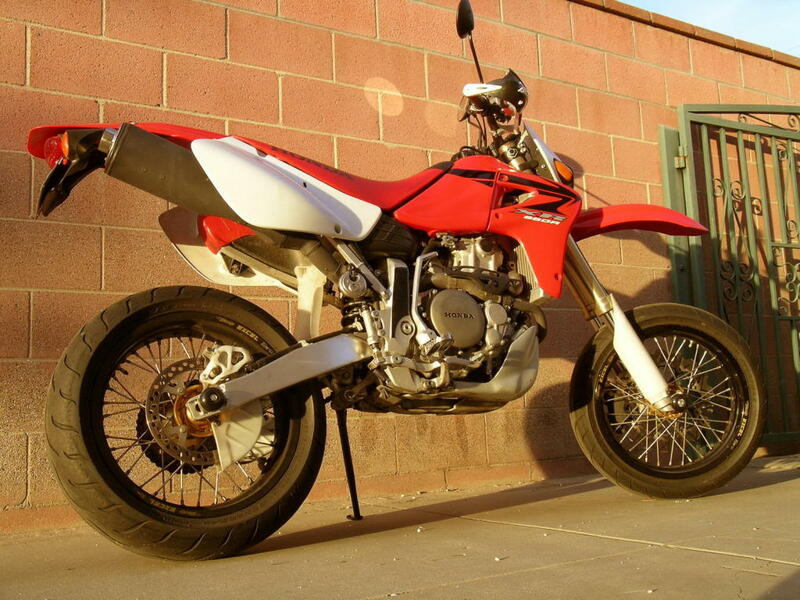 Street-legal supermoto bikes are either converted dirt bikes, or more recently factory offerings. The most prevalent is probably the Suzuki DRZ400SM, there is also the Kawasaki KLX250SF, and the Yamaha WR250X. A few euro brands have street legal supermotos, I think. The factory bikes come with 17" wheels, sticky rubber, different suspension setup, gearing, and brakes. I wont go into the history of Supermoto, it started here, was exported to France, where it got big, and found it's way back. But I'll try to answer some of your questions. I have a Supermoto, one of the best factory "street" supermoto's IMO, an '04 625SMC. Typically supermoto now is known as a dirt bike or dual sport with 17 inch rims. Usually your standard 3.5 front and anything up to about a 5 in the rear (smaller is better, IMO). 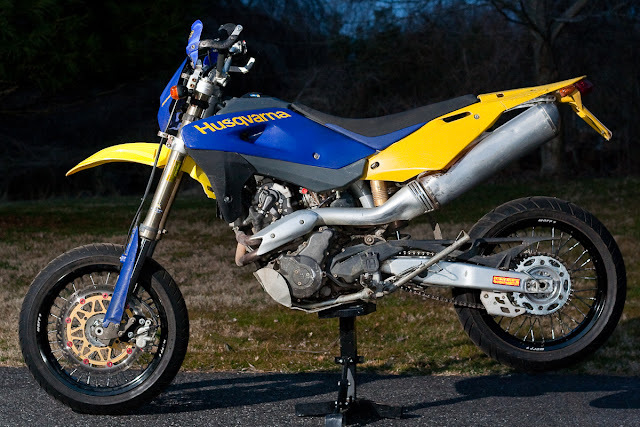 Historically a Supermoto was a cross between a road racing single, a dirt track bike, and a moto-crosser. They could have just about any rim/tire combination and were probably closest to dirt trackers. A dirtbike with street tires on dirt rims is known as a "sportsman" set-up, and is better then most people give them credit for. The biggest difference is based on the donor bike. Enduro or DS vs Motocrosser. Enduro/DS bikes are generally better at being street supermoto's, MX'ers are better race bikes. What's your definition of "older"? How much did you want to spend? Sounds like you're looking for a gymkhana-type bike. Supermoto would be great for that. You're best bet is probably something that's already built, either factory or swapped. Converting a dirt bike is expensive, and you can get the same thing already built for less then what you'd spend building it, a second set of rims alone would be a grand, maybe more, and that does nothing to the suspension or brakes. In the range you're looking at the prime factory contender is probably the WR250X. It's small, relatively light, six speeds, FI, low maintenance. Another from the factory option would be the DRZ, it's a little bigger, similar weight, and there's a big aftermarket for them, they've also been built for a while. If you want to go slightly older an "E" model that's swapped would be a good contender too. Lighter than the S or SM, better carb, exhaust, cams, and higher compression. XR400 wouldn't be bad either, but that might be hard to find swapped. The disadvantage of factory supermoto's is they're going to be heavier then a purpose built bike that's been swapped. And Japanese factories just started building them a few years ago, so "older" is tough. The advantage to factory built bikes is they're a little better on-road. The DR650 and XR650L are very popular converts, they make great road bikes and commuters, and still handle off-road pretty well, but that's bigger then what you're talking about. For a dirt bike that's been built, your best bet might be a CRF250X that's been swapped (depending on how hard it is to get tags where you are). It'll be lighter, and faster, but less suited to around town/commuting. If you want to go older then that the WR yamaha's are good too. IMO the CRF X and WR make better SM's than the CRF and YZF models because of the wider gear ratios and other enduro mods. If you're looking for a 250 for kart-track days and gymkhana, one of those might be the best bet. A supermoto does not need to be road legal; I'd argue that a majority of them are not. At the last supermoto open track day I went to, probably 75% of the bikes were not road legal, but rather race bikes (conversions and factory). Dual sport implies ability to go off-road as well. There is no strict definition, but I would expect a dual sport to have a 21 inch front wheel. In my opinion, to be a supermoto a bike has to have a 17 inch front and rear wheel, rim width to accept proper sticky road rubber, AND appropriate suspension and brakes to make the tires work. There are no strict definitions for this stuff, but I would propose that a KLR on stock suspension with 17 inch wheels and tires isn't really a supermoto (as the suspension, let alone the motor and chassis, are not really up to the task). You can't put a 190 profile rear tire on a Ninja 250 and call it a superbike. All you really need to know is it is the most fun you can have on two wheels without going out of town. Agreed!!! I owned the factory built BMW XMoto (650 sigle) and now own the HP2 MegaMoto (really big supermoto-like bike). 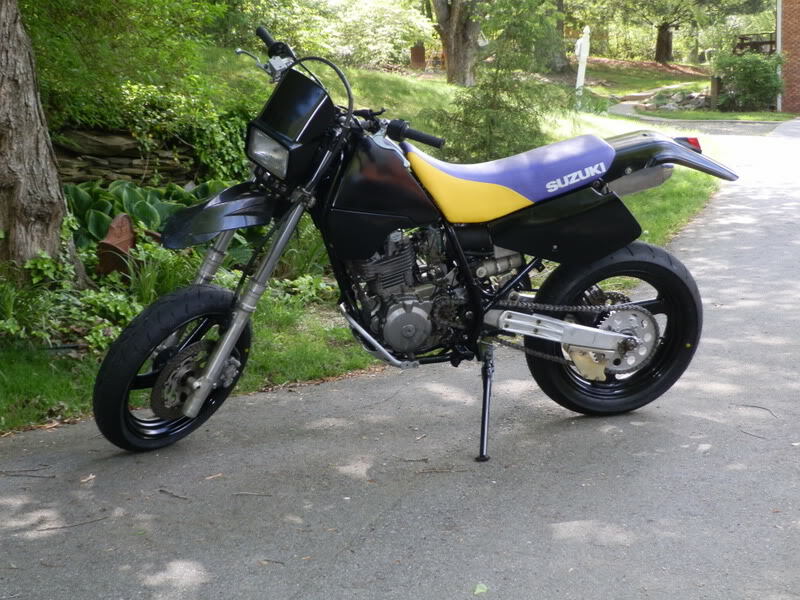 To me, a true supermoto is one that's converted from a 250-650 dirt bike. That's just my opinion though. Motostrano.com sells packages to convert motocross bikes to supermotos. The best part about owning a sumo is out cornering guys on bikes that have two to three times the power you have. The looks on their faces are priceless. Then, to really put on a show, slide the back end out around corners! I'm no expert but something like a DRZ 400 would be ideal, there is a lot of information on converting bikes like XR's, WR 250 / 400's etc. Mainly finding 17" wheels that fit or may need some spacers machined to suit. A pucker Super moto is a bit of a beast, the trail bikes are still light but more manageable & with softer suspension, lower. If you want to go really light 2 T's are fun & easy to maintain. KTM do 17" conversion kits for some of their bikes, lovely rims & a bloody great big front disc. I nearly bought an EXC 300 with the super moto kit chucked in. Self preservation prevented me. They are all fairly tough, most I see down here have crash knobs for protection, not a lot more. The plastics are tough too, they bend rather than snap. Simple things like having spare clutch & front brake levers keep the bike rolling after an off. They are huge fun too, you can get away with murder on grippy, light bikes. I do. Bearing in mind the purpose of the bike, sport touring tires would be a good choice, they heat up quicker than sport or racing tires & have truck loads of grip from the off. A lighter bike will not justify super sticky tires unless you intend going racing. Im looking at the new Husky SMR511. Just seems like the Europeans have the Motard linup down. I dont want a damn Yamaha 250. When they bring out a SM with the new WR450 engine in it i will come back to Yamaha. Until then im seriously looking at Huskys. That is fing sweet, looks like a HD engine with the rear cylinder removed? Where do I find more about this bike? Would love to see a build thread! Since PhiSig1071 mentioned one, here is a pic of mine. Absolutely great in the tight technical stuff, cruises at 85 all day, gets 45-48 mpg and makes a great commuter to boot. If I could only keep one bike, this is it. Find one already set up and plated and be a happy man, that's how I got mine. I would be tempted with that. Do you have a lot of exhaust thefts in your neighborhood? So I'm reading your comment and wondering how you know that I've had two Catalytic converters stolen off my Nissan Pickup Truck, both in front of my house. In the infamous words of Gilda Radner: Never Mind. The disc lock is looped through a band clamp that is bolted to the frame at one of the muffler bolts. I use it to lock the rear disc since the bike has no steering lock. I also added a key switch to shut the ignition off since the XR doesn't have one stock. Excellent info here. Thank you everybody. Bike will be used for motogymkhana, yes. I definitely do not want to get a brand new bike, just to slide it the next day at a practice session. Budget would probably be around 2-2.5 grand, that's total, including any mods that I would have to do, registration and insurance. I honestly don't know how realistic this budget is for this type of a bike. So it might change. That XR looks very tempting, but might be too much power for my needs. WR250 or maybe drz would be more up my alley. Power needs to be manageable, and for the motogymkhana type of riding, displacement is not critical. In fact, I would rather prefer less power, as top gears are never used, and I just need the low end pull and acceleration. I'm on my Speed Triple right now. Its a great bike, but its a bit of a pig for this type of riding. The act of picking it up off the ground alone, is a story in itself. I will continue on my Triumph, but for the next year, already gathering up info on a more dedicated gymkhana bike. This is a great start. I'm with dbarale, the people who say it will cost you a grand or two just for wheels are partly right, it can cost you that much. But I converted my XR250L using Suzuki GS500 cast rims and the whole thing was accomplished for $300 using basic workshop tools (didn't need any machining on the wheels like so many other conversions require). It's a ton of fun. It sounded like Gymkhana. You very well may be able to meet your budget on a pre-built bike if you don't need it to be street legal. If you need it to be legal then it might get a little tougher. I think the perfect bike for you would probably be something based on a 250 MX bike. I still think the CRF250X or WR250F would be the best bet, especially if you need it to be street legal, if that's not a necessity, then any 250MX donor should work. Check SM or racing specific forums for bikes for sale, you should be able to find something. Looking on supermotojunkie I found a few candidates. In NJ, street titled, CRF450 for $2500, or $3k for both dirt and sumo. Can't beat it.